Our favourite glue of them all for assembling card models. One bottle will build 100's of models, it's amazing stuff. For super fast assembly of card models. Will also bond Balsa wood, paper card to most plastics. Use very sparingly, press parts together. Supplied complete with fine tipped applicator for precise application to small components. 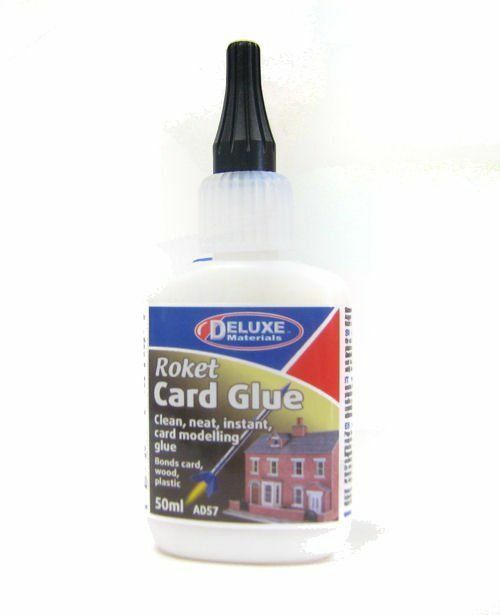 The best glue I've yet found - especially for sticking paper/card to acetate! Tried glue on picnic benches,I ordered at same time, as Three tubs of scatter,& manholes. every thing was packed well.And got here before I expected it to. Thanks Mick. Mary is my wife, She orders for me.